I've been lookin' for this for a while now. Sorry, I'm late. Just startin' playin' S3 again. Thanks for this sick floor. Awesome! Great Idea. Looks awesome with solid color tiles but as soon as I use a pattern, it blurs out of focus and doesn't look so good anymore. It goes back into focus with CAS but reverts back to out of focus once I close CAS. It's not a resource or performance issue as my PC is a higher end model. 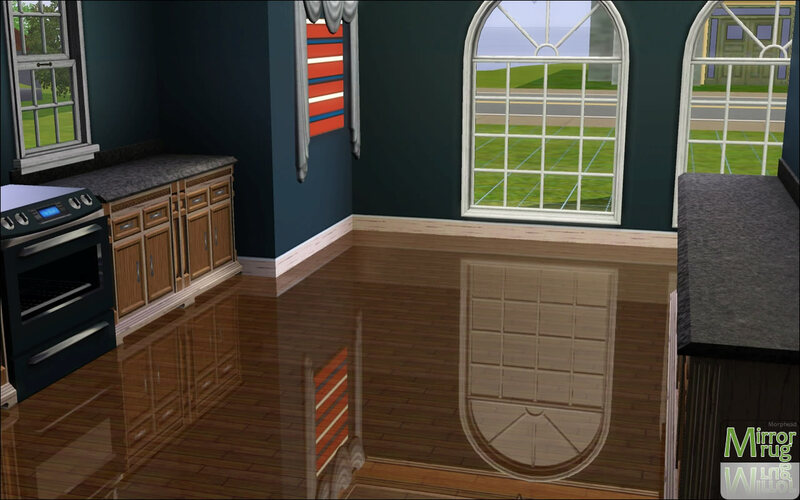 It would be perfect if we could add just a shine to the floor tiles rather then being limited to changing patterns to change the look (the wood pattern in the Mirror Rug is nice, but it doesn't go with everything and just changing patterns doesn't make the nice wood floor tiles available to shine); is it possible to make the Mirror Rugs with only an alpha channel and a transparent texture? Cyclonesue, from TSR, made cast iron rugs with transparent textures so you could see through the open spaces between the iron bars to the level below. Would this work to add a shine to any floor tile under the Mirror Rug? Thanks and awesome work. I read the previous posts and the issue with the pattern blurring was not addressed, but, I did see that you mentioned that transparent textures were impossible with mirrors. I can't help but wonder if there is a work-around for this ... such as making a mirror floor tile and making rugs of wood or stone semi-transparent? 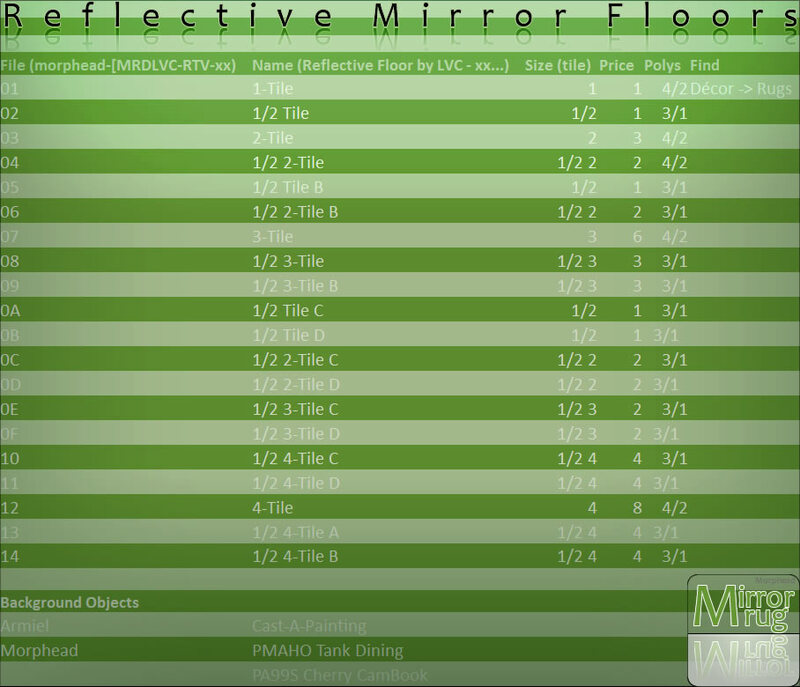 Essentially, buying the mirror tile and placing it like you would the 0$ tiles you mentioned, then placing the semi-transparent rug with the wood or stone flooring rug. Yes this is more work intensive for sure, but you could reduce it if you only made a single tile and half tile for each floor style. 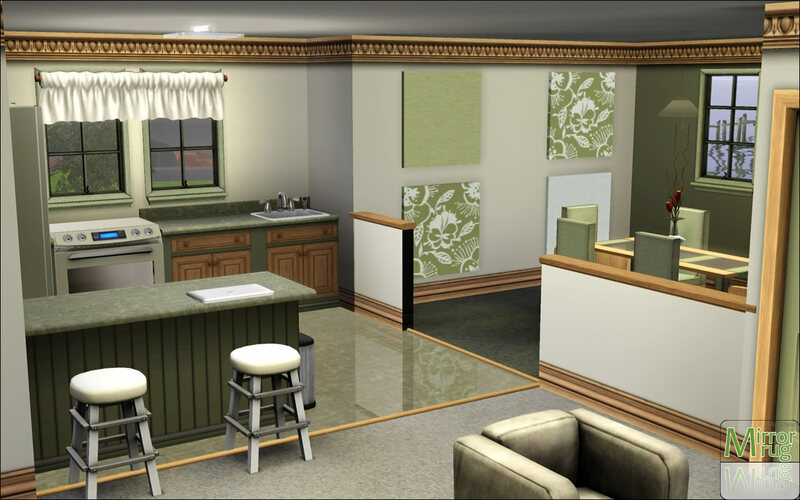 It does mean placing alot of rugs, and I don't know what that might do to performance, but it might also get around the pattern blurring issue as it doesn't seem to effect the current single tile Mirror Rug. I've been taking a closer look at your Mirror Rug and found an issue .... or two. The pic attached is self explanitory, but because the patterns take a hit on the larger Mirror Rug tiles, I was planning to only install the single tile Mirror Rugs. Which rugs are which? The file names don't match the ingame names; such as 1/2 A tile, and 1/2 B tile. I managed to pick out the single tiles but only after plugging in and pulling out files and starting the game for each change repeatedly. In the end, there is only one complete usable set of single tiles where there is no pattern blurring and that one is the higher reflective Mirror Rug. I'm looking into the idea I had in the first Update in this post, I've never created anything in from scratch ... so really I'm going into this blind. It would mean alot if I could get help with this from someone who's already been there. thanks, i love it !! 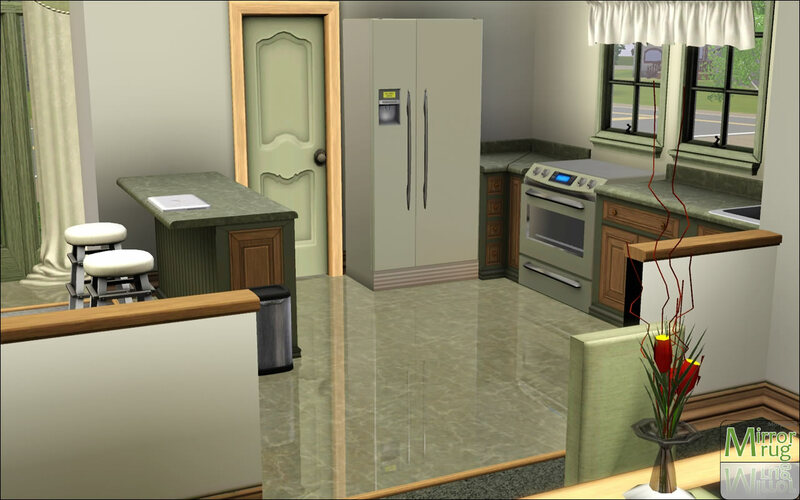 These floors look great but is there any way that you can convert them for sims 4? thankyou so much this mod is amazing!!!!! it makes your floor look awesome!!! After all these years this is the only sims mod I remember. It's the best! These are really awesome. 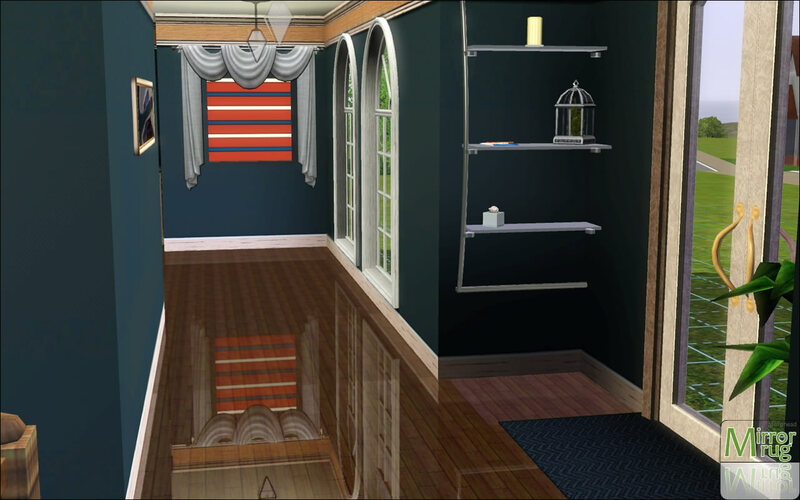 I use them all the time and the recolor option of TS3 makes it compatible for any type of room. I almost overdo it when I use them, that's how awesome they are! Big THANK YOU!